While I was watching ‘Silly Pizza Song‘ by Signing Time together with Dot, I suddenly thought of making pizza. The first pizza I made was a ham and cheese and this second time I was scratching my head thinking of what toppings to use for my pizza. I am thankful that our pizzas turned out well despite not baking for quite a well – all thanks to Charmaine who gave me ideas for pizza toppings via Twitter and Jamie Oliver for the pizza dough recipe!! Dot was excited that we were going to make pizza together. It will be her first time making and eating pizza. She had the chance to knead take a little of the dough to play but she did not like the dough sticking onto her fingers. I explained to her step-by-step what I was doing while making the pizza. 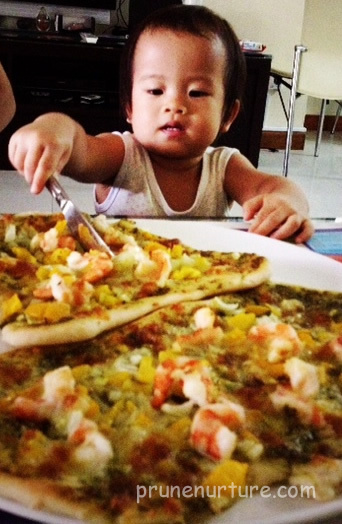 She has the chance to watch the whole process of pizza making from the kneading, the growing dough, the rolling and flattening of the dough, the spreading of the toppings to the baking of the pizza, though she did not participate in every step. Wow! It took us at least 2.5 hours to make the pizzas. I was so hungry while making pizzas! 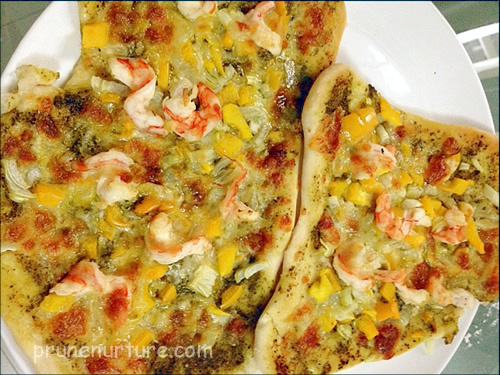 The best part everyone had been waiting for – to feast on our homemade pizzas with basil pesto sauce, yellow capsicum, onion, prawns and mozzarella cheese! Heat the oven at max temperature (300 degree C) for at least 15 minutes before putting in the pizzas. I put in the pizzas when the oven was only heated for about 5-10 minutes, the crust was not as crispy as I had expected. The second round of baking was just right. Yes, I have fulfilled what I wrote in my previous post on wanting to bake with Dot this year but this will not be the only time! Would love to cook with Dot more, any creative cooking ideas to share? Massive amounts of toppings on those pizzas not found on store bought ones. Love the yellow capsicum which gives it a bright cheery colour. A tip to make the base crispy is to place the pizza tray in the oven as it is heating up. When you’ve rolled the dough out, place it on a piece of baking paper, add topping and lift using the baking paper onto the heated tray.